More than half of early-career scientists who received their first research project (R01) grants from the National Institute of Allergy and Infectious Diseases (NIAID) are successful in obtaining subsequent funding from the National Institutes of Health (NIH), according to a study published September 12 in the open-access journal PLOS ONE by Patricia Haggerty and Matthew Fenton of NIAID, an NIH institute. The survival of junior scientists in academic biomedical research is difficult in today's highly competitive funding climate. NIH data on first-time R01 grantees indicate the rate at which early investigators drop out from an NIH-supported research career is most rapid four to five years from the first R01 award. The factors associated with a high risk of dropping out, and whether these factors impact all junior investigators equally, are unclear. 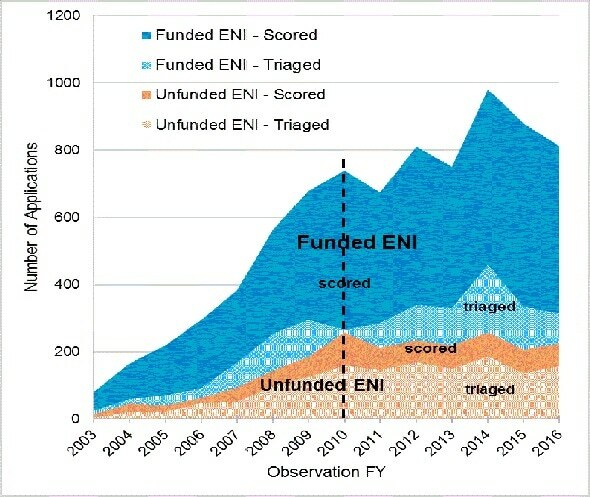 In the new study, Haggerty and Fenton set out to better understand how first-time NIAID awardees compete for subsequent R01 awards and what their funding outcomes were. The researchers identified a cohort of 1,496 investigators who received their first R01-equivalent (R01-e) awards from NIAID between 2003 and 2010, and studied all their subsequent NIH grant applications through 2016. Ultimately, 57% of the cohort were successful in obtaining new R01-e funding, despite highly competitive conditions that favored more senior investigators. The early-career scientists who successfully obtained new grants consistently submitted more applications per year, more renewal applications, and more applications to multiple NIH Institutes. Funded investigators had better scores on their first R01-e grants and demonstrated an early ability to write better applications that would be scored instead of triaged.